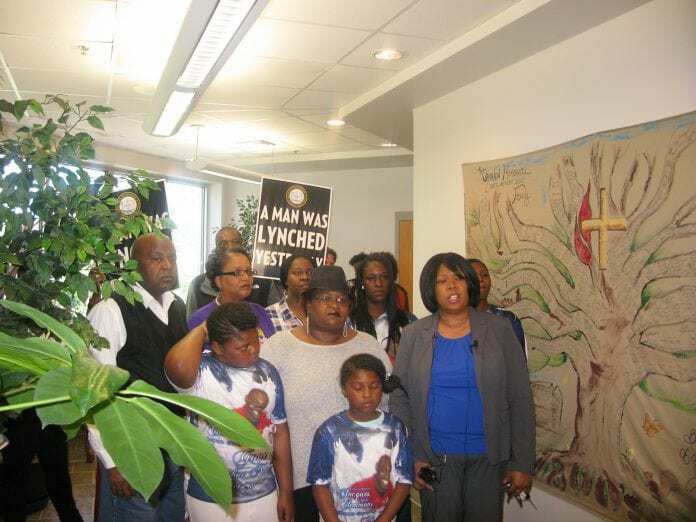 NASHVILLE, TN – On the heels of an agreement between Mayor Barry, MNPD and the TBI on police investigations, the Tennessee State NAACP in conjunction with the family of Jocques Clemmons has called for accountability of the police department. “We just don’t believe the police can police the police,” said Ms. Gloria Sweet-Love, President of the TN State Conference which was held in Nashville. The NAACP along with coalition partners from across the state hosted a press conference calling for a fair and unbiased investigation by the Tennessee Bureau of Investigation and the Metropolitan Nashville Police Department. They are also calling on Mayor Megan Barry and the Metropolitan Council to establish an independent, Community Oversight Board (COB) to conduct investigations of the police department dealing with cases of excessive force and any other police accountability issues. These demands are in response to the continuing outcry for accountability in the case of Jocques Clemmons, 31, who was killed on February 10 by MNPD police officer Joshua Lippert. In the midst of Clemmons’ case, a series of emails between the state District Attorney Glenn Funk, TBI director Mark Gwyn, and MNPD Chief of Police Steve Anderson on the department’s insistence to continue conducting an investigation independent of the TBI prompted all three parties to sign an agreement called a Memorandum of Understanding (MOU) that future fatalities by police will be investigated by the TBI. “I met with the TBI, MNPD, and the District Attorney to discuss these issues. At that meeting, the TBI expressed full confidence in the progress and integrity of the ongoing investigation in the death of Mr. Clemmons. Throughout the investigation, both the TBI and MNPD have been committed to finding the truth and have been vigilant in collecting evidence and information that will be presented to the District Attorney in the shooting of Mr. Clemmons by Officer Lippert,” Mayor Barry said in the statement. This agreement includes future investigations and is not enough for his family. They plan to continue to demand change of the process of investigations fighting for a Community Oversight Board with the NAACP and other coalition partners. “Right now we are concerned with Nashville Davidson County because that’s where we are and that’s why we are here. Jocques was not the first person to die at the hands of a metro police officer and if things continue as they are, he probably won’t be the last,” said Joy Kimbrough, lawyer for the family. His sister Aja Tate echoed this desire for justice in the killing of her brother. “We want justice to be served. We do not want the same thing as everybody else. Somebody has got to make a difference, and somebody has to be held accountable for killing these black men. Nashville must stand up and be the ones to break this cycle. We want justice and peace for Jocques,” Aja said.